December | 2014 | H.A.W.K.S. 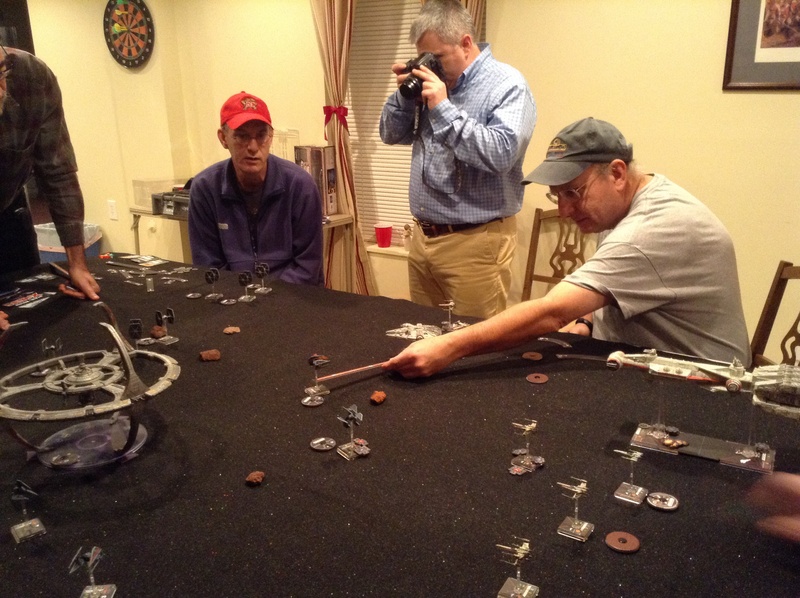 Rebels attempt to destroy an Imperial communications satellite. The HAWKs New Years Bash got of to a rousing start with a GASLIGHT extravaganza, ” Duke Morrison Saves Christmas”! Happy New Years to all our readers! 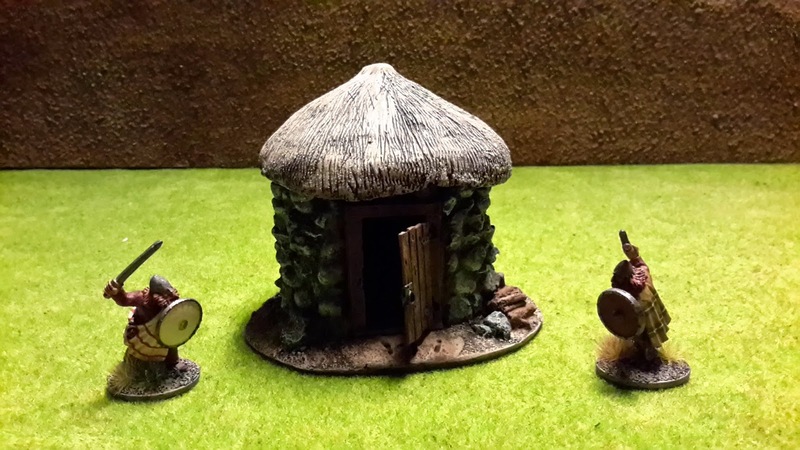 I finally got around to painting a Dark Age Small Hovel from Architects of War that I got from the Toys for Tots raffle at Fall In 2013. It painted up easily. The hovel will make a fine addition to my 4Ground buildings. I’m sorry, but I was making merry a little too much this week with friends and family, and I was unable to complete a figure for posting. Hopefully, by next Monday I will have something ready to post. I hope you all have a great New Year. See you all in 2015! Woody Kineval, Don, Noah, Eric, and Geoff admiring the chaos. 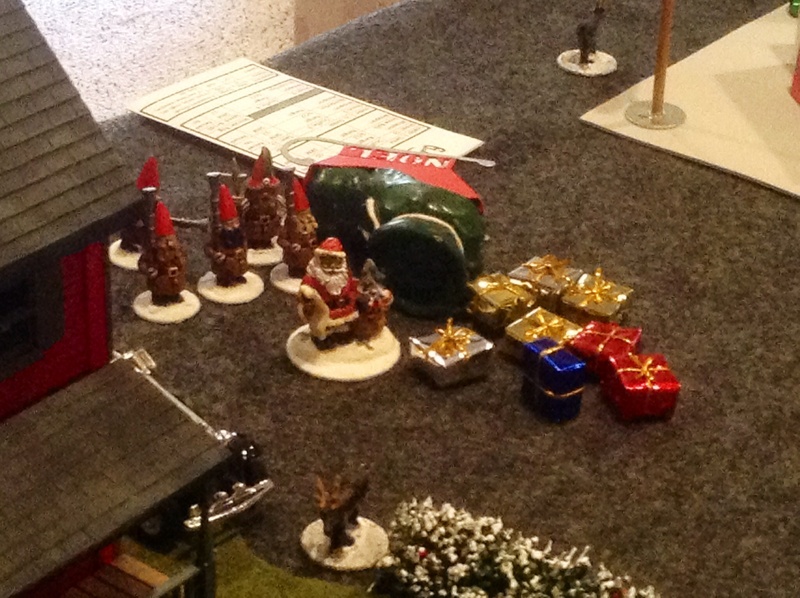 One of many HAWKs traditions is the Christmastime game at Duncan’s house sometime during the holidays. Often the game is set in the War of 1812 and often in the winter. This year Duncan hosted an American raid on a British encampment in Canada in the winter. The American objective was to capture supplies, loot, and plunder. The British objective was to hang onto their gear. In the past, Duncan has used a variety of different rule sets, including GASLIGHT, for these games. 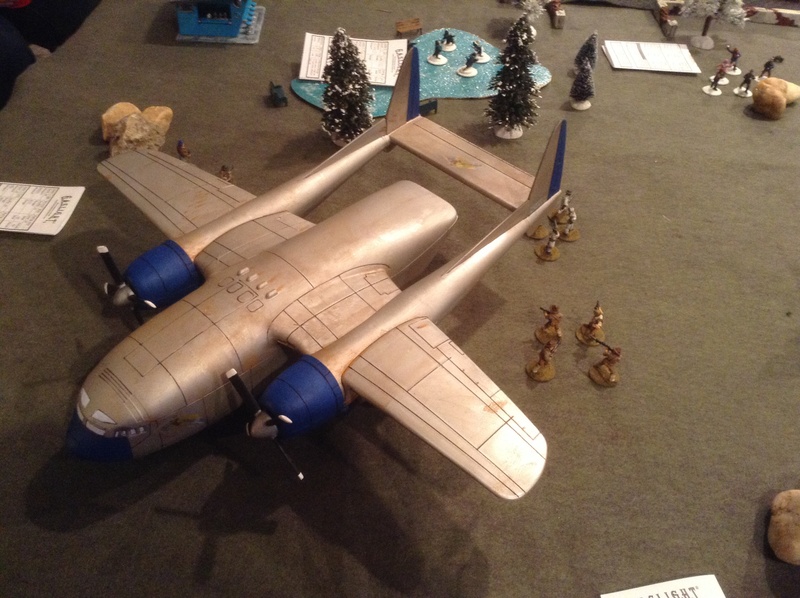 This year Duncan wanted to try using my G.A.M.E.R. rules that are under development. In general, though there are questions about a set of rules that are still under development, the system worked well enough. Dave’s men rushed to the front and then couldn’t the broad side of a barn. Each player had two six-man groups and a leader to control. Dave’s troops had high morale (“guts”) but terrible accuracy (“shooting skill”). He rushed forward toward the enemy and then missed with nearly all his shots and Don laughed at him and taunted him. There was a furious melee in the woods just behind the plantation house, where Noah is seen in the photo moving his troops. After the melee, which lasted a few turns, Eric was victorious, and Noah was out of the game. Don taunted Noah too. On my side of the table, Bruce occupied the brown building in the picture and then proceeded to decimate Jim’s and my forces. We thought Bruce’s forces were snipers armed with Gatling guns. On the first or second turn, Rob incapacitated my officer. The officer had moved to the edge of the woods in the center right of the picture to locate the enemy. He found them, but didn’t live long enough to let the troops know. By the end of the game Rob and I had ground each other to a pulp, but he managed to capture two cows. Don taunted me as well. The game was a lot of fun. Lots of folks brought cookies and snacks, so the holiday season pig out continued unabated as we battled. Thanks to Duncan for hosting! For the Portable Fantasy Game, I built a half dozen or so building from Dave Graffam Modelsreduced to 65% of their original size. For home use, I have been wanting to do a few at full size for various games, but particularly for Song of Blades of Heroes on a 3×3 table. I had some time to do that this weekend. Here are two buildings I’ve done so far, the Country House to the rear, and the Crescent Moon Tavern to the fron and right. I also finished off the Patrol Boat while waiting for glue to dry…it’s been sitting half-built in the paper modeling box for a while. I had thought that I was going to add stone walls to the bases and give each of the houses a small enclosed area, but the Country House, in particular, was already on a base about 10” square, and a visually appealing fenced yard would have nearly doubled the base size (to 10×18 or so). I concluded that was probably more than I wanted for use on a 3×3 cloth. On top of that, there is the matter of the cubage for storage purposes. At least they are very light. I have some Fat Dragon models that are supposed to fold flat for storage on my to-do list. I’ve got one more printed out, and the base flocking to do, and then it’ll be time to put them in a game. 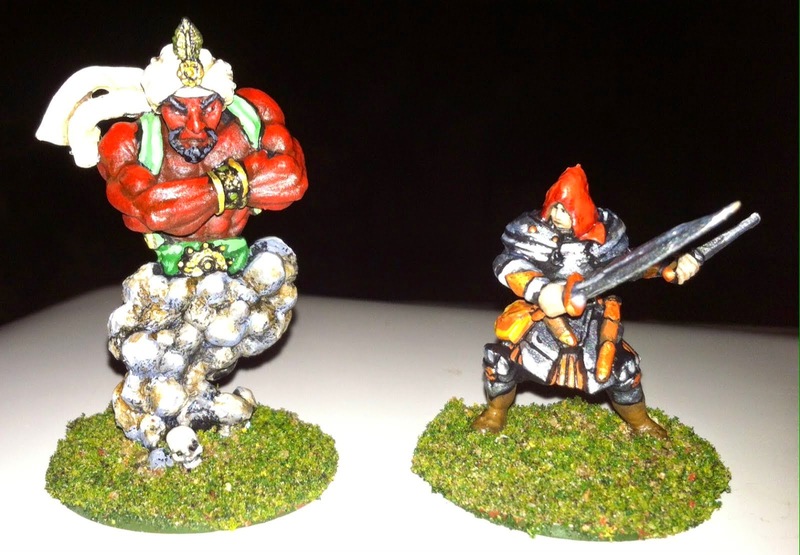 I finished off another pair of figures today. The dual armed fighter is one of the Reaper Bones; not one of my favorites, but I’m trying to expand my Song of Blades and Heroes warbands. The djinn is a Reaper metal figure. People are always asking, “What are you painting these days?” Well, here are a few things I finished this past week. I know it is a strange assortment but I wanted to finish a few figures that have been sitting around for a while. 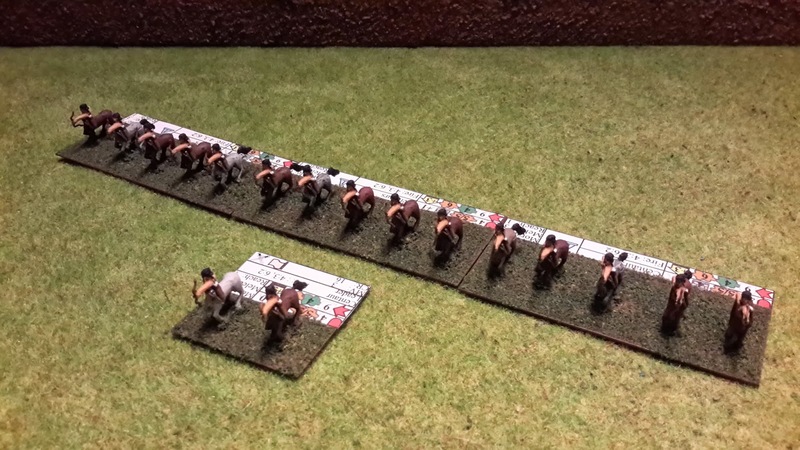 First up some 10mm centaur archers based for playing LSNC: Bear Yourselves Valiantly. Unfortunately I have these for so long I do not remember the manufacturer. 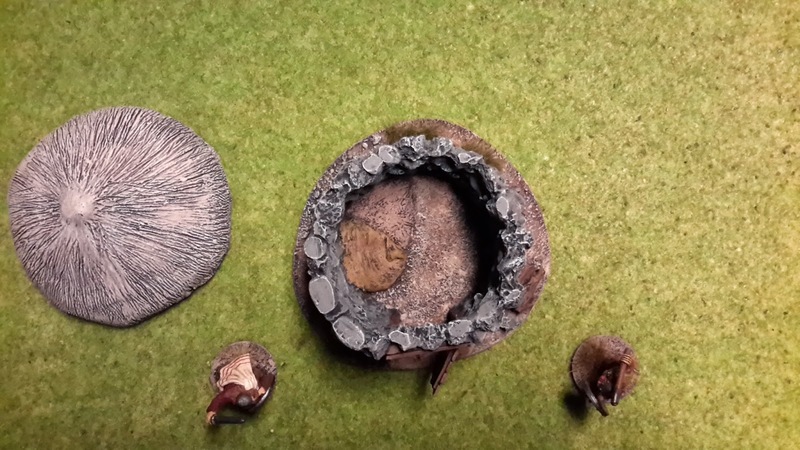 Next we have a base of 10mm elephants by AIM. Again, based for Bear Yourselves Valiantly. 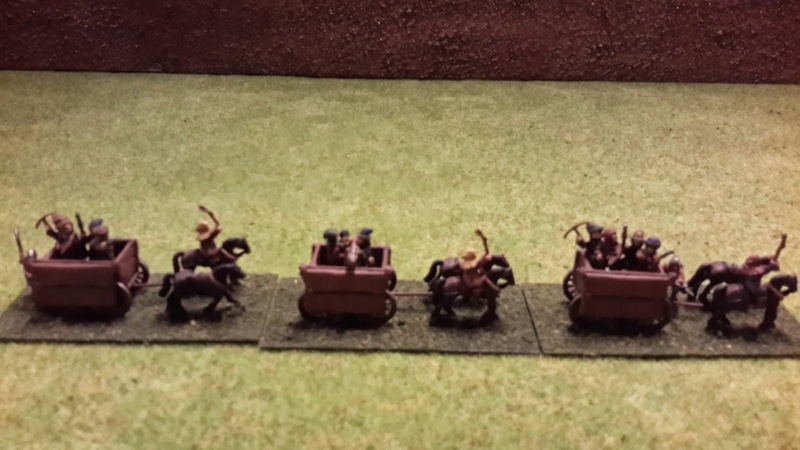 Now for something a bit larger….15mm Hussite war wagons from Essex. I had started building a Field of Glory army but my opponent moved out of town so they have been sitting around collecting dust. Finally, they are done. 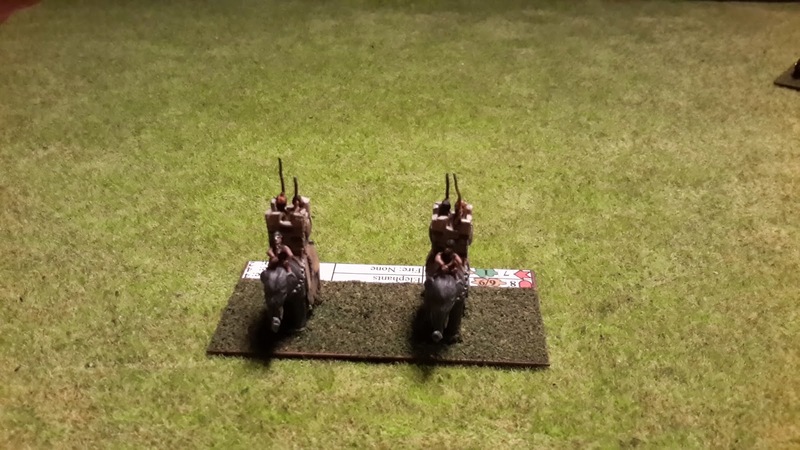 And the last few figures…more Essex 15mm. 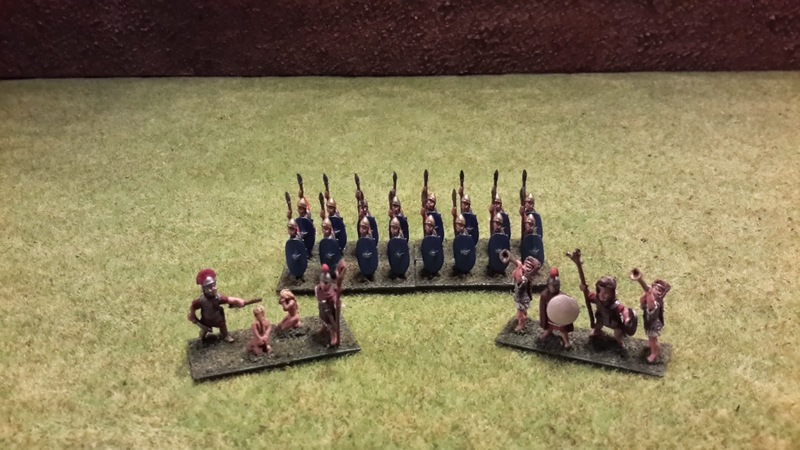 This time a unit of Carthaginians and two Roman command stands. Hopefully I’ll be able to get some more stuff finished during the holidays….as well as some gaming time.